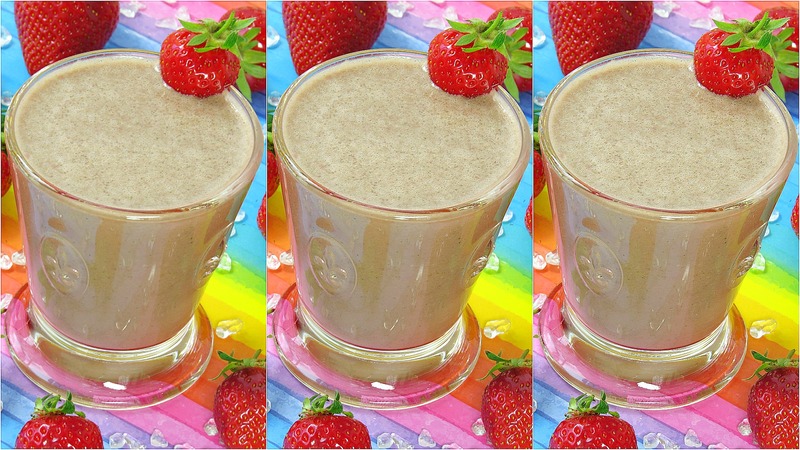 Chocolate and strawberries combined in a milkshake is just heavenly. And I bet it brings back a lot of childhood memories for almost everyone. What I love about this recipe, is that it is super versatile and you can replace the strawberries with every fruit of your choice like blueberries, peaches, bananas, apricots, papaya, etc. or simply enjoy it all by itself. Maca root is a member of the cruciferous family (broccoli, cabbage, etc.). It mainly grows in high altitude regions of Peru. The maca root is a super nutritious superfood as it is packed with lots of nutrients and even has a higher calcium level than milk. It’s said to increase women’s and men’s fertility, to help in balancing out hormones, to boost the immune system and leads to an increased energy, memory and focus. Add all ingredients into the blender and blend it up until creamy.